Chicco's award-winning Bilingual Talking Farm improves children's language, thinking, and musical skills in both English and Spanish. The Bilingual Talking Farm teaches children how to listen, recognize, and speak by teaching them to count to 10 and by helping them learn 11 animals' names, colors, and sounds. It includes four interactive modes with learning games involving naming, matching, answering, and sequencing. 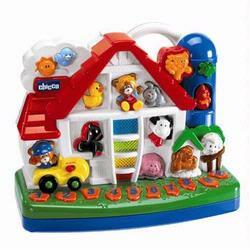 Each level becomes increasingly difficult so that the toy expands children's skills. This toy improves children's abilities to listen and sing along with its 8 nursery songs that are accompanied by electronic flashing lights. Award Winning Toy!